LukeSports is proud to announce the addition of Ultimate Frisbee to our LukeSports programs in 2018. This sport will be played at the same time as the Soccer program in the same location – Georgia Soccer Park. Typically the schedule will be set up to allow for teams playing Soccer to also be able to play Ultimate games. Teams may wear the same uniforms created for Soccer. If a team is not playing Soccer, all players must be identified by same color jersey. 2017-2018 LukeSports League fee for playing Ultimate Frisbee is an introductory price of $250 per team. Teams are 6th, 7th, and 8th grade (Co-ed Mandatory). Ultimate is played between two teams of seven players on a large rectangular pitch. A line drawn across the pitch at either end creates two “end zones” (like in American Football). These are the goal-scoring areas. A goal is scored when a team completes a pass to a player standing (or more likely running) in the end zone they are attacking. Players cannot run with the disc. When you get the disc you must come to a stop and try to throw it to another player (a bit like netball). By passing from player to player, the offense attempts to work the disc up the pitch towards the end-zone they are attacking. If the disc hits the ground or is intercepted or knocked down by the other team, then the opposition takes possession (a change of possession is called a “turnover”, like American Football). Possession also changes if a receiver is outside the playing area when he or she catches it. The defending team attempts to stop the team with the disc from making progress up-field by marking them (as in soccer or basketball). The theory is that the offense won’t want to pass to a player who is being marked closely, as it’s likely to result in an interception. So it boils down to the offense players trying to get free of their markers to receive a pass, while the defense makes every effort to stay with them in the hope of forcing a turnover. 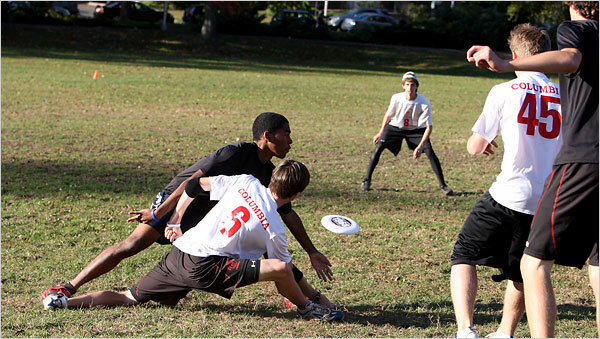 Ultimate is unique in that it is typically refereed by the players themselves, even at World Championship level, according to a code of conduct known as “the Spirit of the Game”. This places the responsibility for fair play on the players themselves. However, LukeSports in it’s inaugural season, will have Observers acting as Referee’s overseeing the competition. The LukeSports Ultimate league will play the game based upon the following 10 simple rules. The Field: A rectangular shape with end zones at each end. End Zones are15-25 yards deep. Regulation size Ultimate Frisbee field is 70 yards by 40 yards. Overall dimensions for the Ultimate Frisbee field is 120 yards x 40 yards. A standard soccer field will be used and modified to accommodate playing Ultimate Frisbee. Non-contact: No physical contact is allowed between players. Picks and screens are also prohibited. A foul occurs when contact is made. Players agree to abide by the sportsmanship rules of good conduct as outlined in the standard LukeSports rules and policies. Fouls: When a player initiates contact on another player a foul occurs. When a foul disrupts possession, the play resumes as if the possession was retained. If the player committing the foul disagrees with the foul call, at the discretion of the Observer, the play is redone. If a player is too physical or too rough, that player will be removed from the game for remainder of the half or entire game depending on severity of the foul. Observers: LukeSports will provide 1-2 observers per game to maintain rules and safety. These “Rules” are intended to help clarify the rules for novices. They are not intended for complete newcomers to the game (try Ultimate in 10 Simple Rules above), nor are they a replacement for reading the full rules. Due to the non-officiated nature of Ultimate it is the players responsibility to have a reasonable understanding of the rules, these documents were intended to make the process of learning/teaching the rules easier. They work best when introduced one at a time – perhaps over a series of weeks at practice or league.